How to keep cool in the heat. I’m asked this fairly regularly, so thought I would share some simple tips that I use to keep cool in the heat. Keep hydrated! This has got to be the most important thing. Drink plenty of cool, or room temperature water. 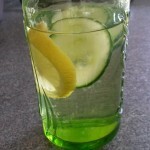 Many people say they don’t like water, so here are some suggestions to make the water more refreshing; add some fresh mint, lemon and cucumber for a really refreshing, natural and zesty drink. If you like green tea but don’t like hot drinks in the heat, make up some green tea with added mint and/or lemon. Seep to your required taste and then allow to cool. Make up jugs of your preferred choice and keep in the fridge for up to 3 days. When out in the sun, protection is incredibly important too. As a natural red-headed freckly person, I can burn easily. Even 10 minutes in the sun and I can start to burn! I use the Aloe Sunscreen for protection (available from my aloe shop) to keep me from burning. 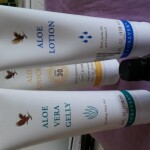 As an after-sun, I use the Aloe Lotion (also available from my shop). If you do happen to burn, adding one drop of lavender oil, mixed into the aloe lotion or the Aloe Vera Gelly, can help to provide additional comfort and the healing properties of lavender oil can soothe and heal the skin. Cooling and refreshing the feet can help alleviate stress and irritability levels. Use a wonderful cooling spray, direct on to your feet, or through socks and stockings. 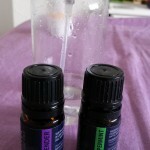 You can easily make your own using lavender and peppermint essential oils. Add 5 drops of each to about 300ml of warm water and just a drop of alcohol (I use vodka). Mix together in a spray bottle and pop in the fridge. Make in larger quantities and you can keep in the fridge for a good couple of weeks. If you used a really fine mist spray bottle, you could use this as a cooling face mist too. Cool showers and baths will refresh hot bodies. You may find yourself wanting to alter to cooler, refreshing body washes when the temperatures rise. I know I do. I tend to move away from the heavier oils and scents I want in the winter months. I love moving towards lemon, grapefruit and mint added to Aloe Bath Gelee in the summer. Take refreshing baths and showers in the morning and evening to keep cool throughout the day and night. If you find yourself wanting to eat lighter foods of salad and raw vegetables, that’s fine. Go with it, it won’t do you any harm and they will help with keep you hydrated too. If you want to find out more about staying cool, calm, less stressed and less irritable in the heat, or more about essential oils, then please just make contact. Call on 01889 808388, email tracey@plumessencetherapies.co.uk or book a no obligation 1-2-1 using the ‘book now’ buttons on the PlumEssence Therapies website.